Titanfall 2 struggled during its debut in October, and now Call of Duty: Infinite Warfare is also seeing a slide of its own. Above: You can get Titanfall 2 for half off at certain retailers. The Activision-published Call of Duty: Infinite Warfare isn’t selling as well at physical retailers in the United States as R.W. Baird analyst Colin Sebastian was expecting. Throughout the holiday gift-shopping season, Sebastian’s team does regular checks with retailers to take the temperature of the industry overall, and he found that the $13.1 billion market for physical games at U.S. retailers is sluggish coming out of the country’s presidential election. But he also doesn’t think that the aggressive price discounts that Activision is already making for Call of Duty and EA is making for Titanfall 2 are a sign of panic. That holiday ramp up could start happening now as retailers have already begun steeply discounting major triple-A games even before the Black Friday shopping deals. 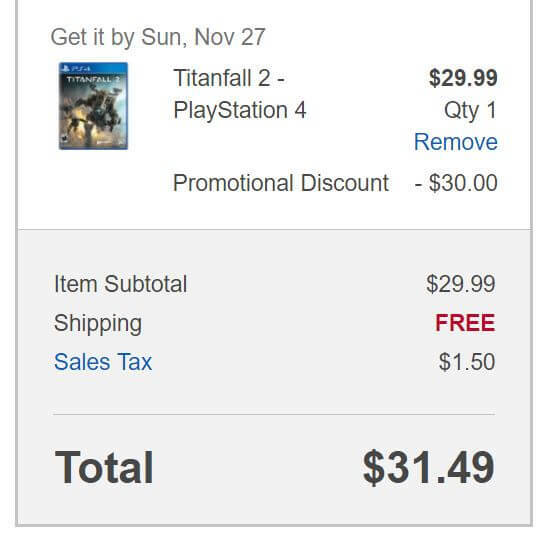 You can buy Titanfall 2 from Best buy for just $30 (using the TITANFALLDEAL promo code), and you can get $20 off of Call of Duty: Infinite Warfare from retailers like Amazon. But Sebastian does not think that these price cuts are a desperate overreaction. These deals may finally trigger consumers into making moves to purchase anticipated fall releases because it’s possible that many were expecting retail discounts as part of Black Friday. “As a side note, recent e-commerce data from Adobe suggests a lull in consumer spending coinciding with the U.S. presidential election, which directionally supports the view that consumers may be pushing out holiday purchases,” said Sebastian. Finally, the analyst thinks it’s too early to call this a “miss” for Call of Duty and Activision. It’s possible that digital full-game sales, microtransactions, and a higher average sales price for people buying the version of the game that comes with Call of Duty: Modern Warfare Remastered will make up for any other shortcomings.